A few weeks ago, I stopped by the Roli Roti rotisserie truck in front of Blue Bottle, a coffee company based in Oakland. 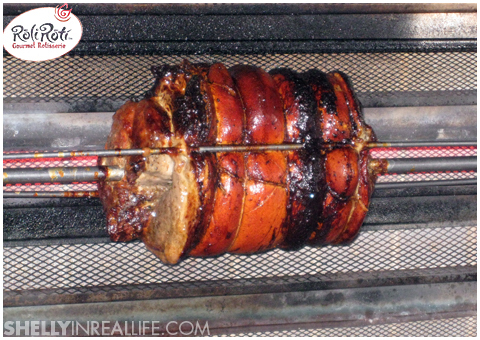 I've heard my friends talk about their porchetta for weeks. People line up for up to and maybe over an hour in front of the Ferry Building in San Francisco for this sandwich. After all the rave, I had to check it out myself. 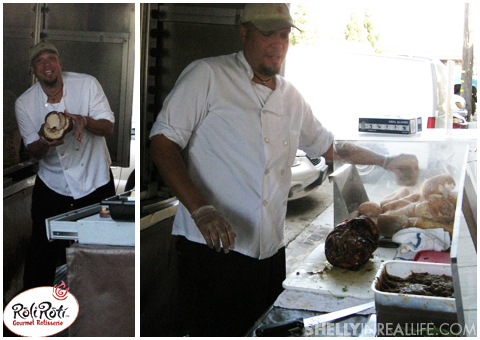 To my surprise, I found out via Roli Roti's Twitter page that they had porchetta trucks in Oakland as well! 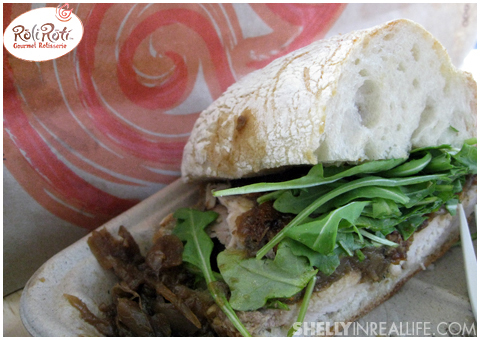 Please note, not all of Roli Roti's truck's serve porchetta sandwiches. Some serve rotisserie chicken with rosemary potatoes that are slowly roasted below the dripping fat/juices of porchetta and chicken. Got to the truck at 11:00 AM, and guess what? There was NO LINE! 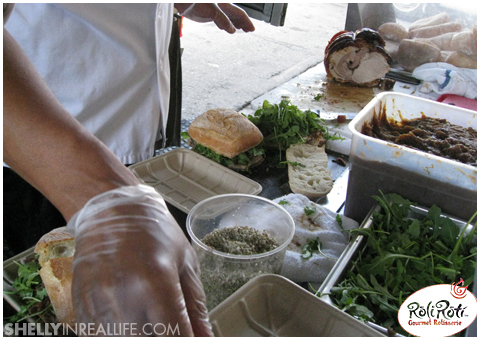 Since there was no lines, porchetta man was SUPER nice and interactive while building the lovely sandwich. He even handed me pieces of the crunchy skin from the porchetta to munch on! The YUMMY Porchetta Sandwich - yes, I asked for extra onions on the side! Some advice: Try to avoid the Ferry Building location if you're not into the lines & go early so that the meat won't be dry by the end of the day. I'm not a fan of sandwiches, but I love this sandwich!! Yum-o!